Aren't you sick and tired of wasting time and money trying chemical-based skin whitening and brightening products that, not only are exceedingly expensive, but also end up doing more harm than good? If that's the case, then treat your skin to what could be missing; this wonderful natural skin lightening serum could be exactly what you need! The secret to the Skin Lightening Serum's great effectiveness lies, of course, in its proprietary formula and natural ingredients. By combining kojic acid, with a number of strong antioxidants, enzymes, resveratrol’s, and herbal essences, the serum helps to inhibit the skin's natural melanin production, reduce the appearance of dark spots, and help to even your skin tone and complexion! A SUPERIOR, NATURAL WAY TO HELP LIGHTEN AND BRIGHTEN UNEVEN SKIN TONE IS FINALLY HERE! - You can forget about having to spend a fortune on products that aren't effective and burdening your skin with unnecessary chemicals. 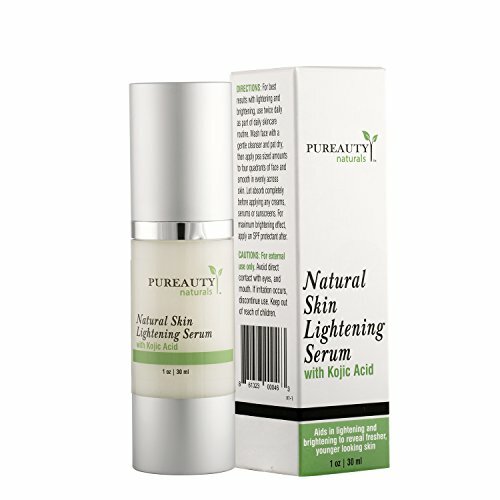 Pureauty Natural's Skin Lightening serum helps to lighten areas with dark spots, hyperpigmentation, and blemishes. With this wonderful serum, the beautifully perfect, smooth skin you've always dreamed of can now potentially become a reality! FINALLY, A SKIN BRIGHTENING PRODUCT THAT WORKS - By helping to suppress the process by which melanin is produced, the ingredients work in combination to help lighten existing areas of hyperpigmentation and to help prevent the development of new discoloration. Pureauty Natural's Skin Lightening Serum helps to produce pronounced and long-lasting rejuvenation and youthfulness to your skin. ADVANCED, UNIQUE FORMULA - The serum utilizes a well-thought-out combination of kojic acid, jojoba oil, green tea extract and a multitude of other skin lightening formulations, antioxidants, and natural active ingredients made for all skin types! PREMIUM QUALITY NATURAL INGREDIENTS - Almost everything your skin needs to help rejuvenate can be sourced by the best ingredient supplier; nature! That's why our advanced formula includes natural ingredients that soften and soothe your skin, including Kojic Acid, Resveratrol, and Green Tea Extract!